Most, if not all of us spend much of our lives working for businesses. Most of us are all too familiar with the experience of working by the hour for wages, believing it has always been this way. Few are familiar with how we arrived at this way of living or of past struggles for things we take for granted at work like eight hour shifts, weekends or sick days. Our labor history as been erased from common knowledge. It has been censored from our schoolbooks and, like working class culture, all but banned from major media except for insulting caricatures. How many reading this ever heard of William H. Sarvis, founder of the National Labor Union starting in the 1840s? Who remembers labor leaders like Elizabeth Gurley Flynn, Big Bill Haywood or William Z. Foster? How many are familiar with the literary contributions of the Lowell Mill Girls or Ira Stewart who began the long and bloody struggle for the eight-hour day? Who remembers the National Railroad Strike of the 1877 which gave birth to the National Guard? Few remember the steel strikes, the bloody repressions and fightbacks in the coal fields of Appalachia, the St. Louis Commune, the Ludlow Massacre, the Flint sit-down strikes or the Longshoreman organizing battles on the 1930s. The history of labor in our republic cannot be separated from the struggle for civil rights. From the first decades of our country, labor was intimately connected to the abolitionist struggle against chattel slavery. Working people understood that they could not compete with slave labor and that the fates of all who toil are bound together. This remains true today as American workers find ourselves competing for lower wages with workers in poor and oppressed countries and increasingly with prison labor. At the onset of the Civil War, early unions all but ceased to exist as members enlisted en masse in the Union Army. In the 20th century, labor unions and socialist political parties played a leading role in civil rights struggles. Labor struggles continue today, like the long overdue teacher strikes around the country and as, ever, the forces of big money and corporate power are a formidable obstacle. The Supreme Court recently demonstrated this in ruling that employers can bar their employees from organizing to challenge workplace abuses including wage theft, abuse and harassment. In dissent, Justice Ruth Bader Ginsburg wrote, “When workers charge their employers with unlawful conduct, in this case, violations of laws governing wages earned and hours worked, there is strength in numbers. As a result of the ruling, there will be huge under-enforcement of federal and state statutes designed to advance the well-being of vulnerable workers." This is a continuation of our common history of struggling against corporate power and its paid representatives for basic justice, dignity, livable wages and working conditions. What drew you to the subject of this effort to organize the Tar Heel Smithfield plant? LW. 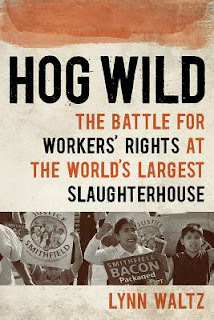 I was working on a profile of Smithfield Foods for Virginia Business magazine and found out they had been found guilty of repeatedly breaking federal labor law since they opened the world’s largest slaughterhouse in Tar Heel, N.C.. I wrote about that for Portfolio Weekly. The case was on appeal at the time, so I followed it and continued to write about it as a graduate student at Old Dominion University. After graduation, I pitched the story idea and University of Iowa Press picked it up right away. Initially my story was about the key whistleblower, a high-ranking manager who agreed to testify for the government against Smithfield. My editor encouraged me to tell the whole story of the unionization, which spanned 16 years. Why did you feel this union effort was worthy of a book? LW. Initially it was the disparity between how Smithfield Foods, a Fortune 500 company, publicly presents itself and its private illegal behavior in both labor and the environment. Then, it was the ironic narrative of a manager who did not support the union, but wound up being the catalyst for the unionization of the world’s largest slaughterhouse. Finally, it was the realization that this union fight is a microcosm for all that is wrong with labor law today, which has disintegrated from what was intended during the New Deal. The National Labor Relations Act was intended to even the playing field between powerful corporations and the worker, but today - between powerful union-busters - hired by companies every time there is a union fight - the long drawn-out appeals system, and the growing right-to-work movement, workers have very little power. What is the relevance of this and what lessons can we, as working class Americans take from this labor struggle? LW. What it seems few people understand is the link between the strength of unions and the strength of the middle class. Since 1971, the percentage of the population that is middle class has steadily declined from 61 percent to 50 percent in 2015. Meanwhile, the percentage of upper middle and upper classes has risen from 14 to 21 percent. At the same time, union membership in the private sector dropped from 21 percent in 1980 to 6.7 percent in 2013. In North Carolina, where the slaughterhouse is, just 1.9 percent of workers were members of unions in 2015, down from 3 percent in 2013. North Carolina regularly is listed as having the lowest union membership in the country. Of states with lower than 5 percent membership, seven of the eleven are in the South, the most difficult place for unions to win. So, that is part of why this case stands out. First, it is remarkable that the union won. Second, the book provides a window into the enormous effort and cost it takes for a union win in today’s world. I am thankful for Lynn Waltz's efforts in supporting the struggle and the consciousness needed for working people to organize for our mutual benefit and security. In the past, working people have had our own, independent political parties, from the 19th century Knights of Labor to the once popular American Socialist Party and later Socialist and Communist Parties – vilified in the “Red Scares” of the 1950's. The real purpose and effect of the McCarthy period was to break the power and influence of the American labor movement and to dis-empower working people. If you want to know more about the history of our American working class and of the inseparable struggle for a democracy which includes us, I strongly recommend reading Labor's Untold Story: The Adventure Story of the Battles, Betrayals and Victories of American Working Men and Women available via Amazon. This invaluable tome is an easy and gripping read which puts our American history and present in a clear perspective. You have another great opportunity to learn some real American history. On Wednesday June 20th a truly great documentary called American Socialist: The Life and Times of Eugene Victor Debs will be showing at the Naro Cinema. Eugene V. Debs was an enormously popular leader who ran for president several times as a socialist – long before Bernie Sanders -- the last time from prison where he was incarcerated for opposing our entry into WWI. If you come to this documentary, you will also have an opportunity to meet and hear Lynn Waltz and to purchase her book, Hog Wild: The Battle for Workers’ Rights at the World’s Largest Slaughterhouse. Great article, Al! Thanks for sharing this! Hope you are feeling better after your stint in the hospital! Al Markowitz a freelance writer, poet, publisher, activist and philosopher. The articles posted here come mostly from those which have been published in Veer Magazine. I also publish the Blue Collar Review, Journal of Progressive working Class Literature.